It was the first major accident involving the new Boeing 737 MAX series aircraft, introduced in 2017, and the deadliest involving a 737, surpassing Air India Express Flight 812 in 2010. It is the deadliest accident in Lion Air's 18-year history, surpassing the 2004 crash in Surakarta that killed 25, and the second deadliest aircraft accident in Indonesia behind Garuda Indonesia Flight 152. The Indonesian government deployed a search and rescue operation which found debris early in the morning and recovered human remains from a 150-nautical-mile (280 km) wide area. The first victim was identified two days after the crash. The flight data recorder was located on 1 November and recovered for analysis. One member of the volunteer rescue team died during recovery operations. The cockpit voice recorder was found on 14 January 2019. Preliminary investigations revealed serious flight control problems that traumatized passengers and crew on the aircraft's previous flight, as well as signs of Angle of attack (AoA) sensor and other instrument failures on that and previous flights, tied to a potential design flaw involving the Maneuvering Characteristics Augmentation System (MCAS) of the 737 MAX series. As a result, the United States Federal Aviation Administration and Boeing issued warnings and training advisories to all operators of the 737 MAX series to avoid letting the MCAS cause an abrupt dive similar to the Lion Air flight. These advisories were not fully implemented, however, and the design issues are suspected to be involved in the Ethiopian Airlines Flight 302 crash on 10 March 2019, leading to the worldwide grounding of all 371 operating 737 MAX aircraft. The aircraft involved was a Boeing 737 MAX 8, registration PK-LQP, line number 7058, powered by two CFM International LEAP engines. The aircraft was leased from China Minsheng Investment Group (CMIG) Aviation Capital and delivered new to Lion Air on 13 August 2018. At the time of the accident, the aircraft had flown about 800 hours in service. This was the first accident involving a 737 MAX since the type's entry into service on 22 May 2017, and the deadliest accident involving a Boeing 737. There were 189 people on board the aircraft: 181 passengers (178 adults, 1 child and 2 infants), as well as six cabin crew and two pilots. Officials confirmed that all 189 passengers and crew on board had been killed. The flight's captain was an Indian national, who had flown with the airline for more than seven years and had about 6,000 hours of flight experience; and the co-pilot was an Indonesian who had about 5,000 hours of flight experience. The six flight attendants were also Indonesian. Twenty Ministry of Finance employees, 10 Audit Board of Indonesia employees, two auditors from the Finance and Development Inspection Agency [id], three Ministry of Energy and Mineral Resources employees, three public attorneys, three Indonesian National Police officers, six Bangka Belitung Regional People's Representative Council members, and three judges of Indonesia's High Court and National Court, for a total of 38 civil servants, three police officers and 10 state officials, were among the passengers. There were two confirmed foreigners among those on board: the pilot from India and an Italian citizen, former professional cyclist Andrea Manfredi. The aircraft took off from Jakarta on 29 October 2018 at 6:20 a.m. local time (28 October 2018, 11:20 p.m. UTC) and was scheduled to arrive at Depati Amir Airport in Pangkal Pinang at 7:20 a.m. It took off in a westward direction before circling around to a northeast heading, which it held until crashing offshore northeast of Jakarta in waters estimated to be up to 35 metres (115 ft) deep. The flight crew had requested clearance to return to the Jakarta airport 19 nautical miles (22 mi; 35 km) into the flight. The accident site was located 34 kilometres (21 mi; 18 nmi) off the coast of the island of Java. Communication between air traffic control (ATC) and Flight 610 was suddenly lost at 6:33 a.m. ATC immediately informed authorities about the incident and the Indonesian National Search and Rescue Agency deployed three ships and a helicopter to the area. At 7:30 a.m., the agency received reports that Flight 610 had crashed a few kilometres from an offshore oil platform. Workers on the platform reportedly saw the aircraft crash with a steep nose-down angle. Boats from the platform were immediately deployed and debris from the crashed aircraft was found shortly after. On 29 October, Indonesia's Transportation Ministry ordered all of the country's airlines to conduct emergency inspections on their 737 MAX 8 aircraft. The ministry would also launch a special audit on Lion Air to see if there were any problems with its management system. The Transportation Ministry announced that all Indonesian Boeing 737 MAX 8 aircraft were airworthy and were allowed to resume normal operations on 31 October. A Basarnas spokesperson confirmed to reporters that the aircraft had crashed; Muhammad Syaugi, head of Basarnas, later confirmed that there had been casualties, without specifying a number. In response to the crash, the Indonesian Transportation Ministry set up crisis centres in Jakarta and Pangkal Pinang. Lion Air also offered free flights for the families of the victims to Jakarta. On 30 October, more than 90 relatives were flown to Jakarta for the identification of the victims. CEO of Lion Air Edward Sirait stated that accommodation had been provided for the relatives, and later added that relatives should go to Halim Perdanakusuma International Airport for further information. The Indonesian National Police announced that a trauma healing team would be provided for the relatives of the victims. Indonesia's People's Representative Council announced on 29 October that they would examine the Standard Operating Procedure of Lion Air and the airworthiness of the aircraft. They would also examine the health history of the crew of Flight 610. The Speaker of the People's Representative Council, Bambang Soesatyo, later asked the government to enforce stricter rules for the aviation industry and to audit every airliner in the country. On 1 November, Indonesian Minister of Transportation Budi Karya Sumadi announced that the government would evaluate every low-cost carrier in Indonesia. As 20 of the passengers were employees of the Indonesian Ministry of Finance, Sri Mulyani, the Indonesian Finance Minister, immediately visited the Indonesian Search and Rescue Agency's office in Jakarta, seeking coordination and further information. She later announced that every employee of her ministry should wear a black ribbon for a week to commemorate the victims. Posthumous awards would be given to the 20 victims and scholarships would be given to the victims' children. Minister of Health Nila F Moeloek and Minister of Transportation Budi Karya Sumadi visited the relatives of the victims. Indonesian President Joko Widodo, who was attending a conference in Bali during the crash, visited the recovery efforts at the Port of Tanjung Priok the next day. The Australian Department of Foreign Affairs and Trade announced that its staff would be banned from flying on Lion Air, as well as its subsidiary airlines Batik Air and Wings Air, until the cause of the accident was known. The Indonesian Minister of Transportation, Budi Karya Sumadi, later stated that his ministry would hold talks with the Australian government about the warning. The government-owned social insurance company Jasa Raharja announced that the victims' families would each receive 50 million rupiah (US$3737) in compensation. In the immediate aftermath of the crash, the Indonesian media were warned by Indonesian Broadcasting Commission for their unethical coverage of the crash. Some media were accused of pushing the family members to answer unethical questions. Chairman of Indonesia's Alliance of Independent Journalists (AJI), Abdul Manan, stated that images of debris were broadcast repeatedly and inappropriately. This, in turn, traumatized relatives of the victims. In response, some Indonesians voiced their anger and disappointment on social media. On 31 October, Transportation Minister Budi Karya Sumadi temporarily suspended Lion Air's technical director Muhammad Arif from his duties based on the crash investigation. Budi said the ministry had also suspended an unspecified number of Lion Air technicians who had cleared the aircraft for its final flight. Indonesia's National Search and Rescue Agency (Basarnas) launched a search and rescue operation, with assistance from the Indonesian Air Force, the Indonesian Navy, and the Republic of Singapore Navy. Basarnas dispatched about 150 people in boats and helicopters to the site of the accident. Civilian vessels also responded to the reports of a downed aircraft, and the crew of a tugboat reported to authorities in Tanjung Priok that they had witnessed an aircraft crash at 6:45 a.m. and located debris in the water at 7:15 a.m. The Indonesian Agency for Assessment and Application for Technology deployed the research ship Baruna Jaya, which had been previously used in the search for Adam Air Flight 574 and Indonesia AirAsia Flight 8501. Officials from the Indonesian National Search and Rescue Agency announced that the search and rescue operation would be conducted for seven days and be extended by three days if needed. A command centre was set up in Tanjung Priok. On 29 October, authorities said that all on board were presumed dead and that the first human remains had been recovered. Divers had located fragments of the aircraft's fuselage and assorted debris, but had yet to find the onboard flight recorders. An official from the Indonesian National Armed Forces suggested that most of the victims were still inside the fuselage, as in the days following the crash rescue personnel only managed to recover a small number of body parts. Officials stated that bad visibility and strong sea current hampered the search and rescue effort. On the same day, the Indonesian National Search and Rescue Agency published the area of the search and rescue operation. It was divided into two main areas. The first was a 62 nautical miles (115 km; 71 mi)[clarification needed] underwater search area while the second was a "visual search" area, 124 nautical miles (230 km; 143 mi) wide. On 30 October, the search area was divided into 13 sectors. The search area was widened to 150 nautical miles (280 km; 170 mi),[clarification needed] reaching as far as Indramayu to the east. Approximately 850 personnel from the Indonesian National Search and Rescue Agency, Indonesian National Armed Forces and volunteers participated in the operation. At least 13 bodies were retrieved from the crash site. Indonesian officials confirmed that faint pings had been heard in the search area. On 31 October, it was reported that acoustic "pings" had been detected, no further than 3 kilometres (1.9 mi) from the group of eight current search points, which were possibly from one or both of the underwater locator beacons (ULBs) attached to the aircraft's flight recorders. The first victim was identified on 31 October. At the time, more than a dozen body parts had been found by authorities. Some of the parts had drifted more than 5 kilometres (3.1 mi) in the sea current. Police also reported that 152 DNA samples had been collected from the victims' relatives. Hundreds of pieces of the aircraft had also been recovered; all of them were transported to Tanjung Priok, Jakarta. Authorities stated that the search area for dead bodies and debris would be focused in the sea off Karawang Regency, a coastal area of Java close to the crash site, as analysis showed that the sea currents in the area would bring debris to the south. A command centre was set up in Tanjung Pakis, Karawang to oversee the salvage effort. On the same day, authorities widened the search area from 10 nautical miles (19 km; 12 mi) to 15 nautical miles (28 km; 17 mi). In all, 39 ships (including 4 equipped with sonar) and 50 divers were deployed to the search area. The Indonesian National Police announced that 651 personnel had joined and assisted in the search and rescue operation. Officials stated that the operation, starting from 31 October, would focus on finding the fuselage of the aircraft and the flight recorders. The joint search and rescue team announced on 31 October that at least three objects, one of which was suspected to be one of the aircraft's wings, were found in the search area. Officials confirmed that "pings" from the aircraft's ULBs were also heard near the area. On 1 November, searchers announced that they had found Flight 610's flight data recorder (FDR), which was located at a depth of 32 metres (105 ft). The cockpit voice recorder (CVR), however, was reported as not yet found. According to a transport safety official, quoted by Reuters news agency, authorities did not initially know for certain whether the "crash survivable memory unit" was from the flight data recorder or cockpit voice recorder, as portions of it were missing. Haryo Satmiko, deputy chief of Indonesia's National Transportation Safety Committee (NTSC), the body investigating the crash, told journalists that the device's poor condition was evidence of the "extraordinary impact" of the crash, which had separated the memory unit from its housing. Despite the damage, investigators were able to recover data from the aircraft's most recent 19 flights spanning 69 hours, and planned to begin analysis on 5 November. On 2 November, the joint search and rescue team deployed more than 850 personnel and 45 vessels to the crash site. The aerial search area was widened to 190 nautical miles (350 km; 220 mi) and the "underwater search area" was widened to 270 nautical miles (500 km; 310 mi). Joint search and rescue team announced that some engine parts were found in the search area. One of the aircraft's landing gears was recovered in the afternoon. Meanwhile, the Disaster Victim Identification team stated that at least 250 body parts had been recovered from the crash site. On 3 November, it was reported that a volunteer Indonesian rescue diver had died during the search, on the afternoon of 2 November. It is believed he died from decompression sickness. A second landing gear and both of the aircraft's engines were recovered by search and rescue personnel, and the main body of the aircraft had been located. The main wreckage of the aircraft was located 7.5 miles (12.1 km)[clarification needed] from the coast of Tanjung Pakis and was about 200 metres (220 yd) from the location where the FDR was discovered. Divers were immediately dispatched to the area. Faint "pings" from the ULB attached to the aircraft's CVR were also heard. On 4 November, nearly 1,400 personnel, including 175 divers, were dispatched to the crash site. 69 ships, 5 helicopters and 30 ambulances were also dispatched. The Head of the Indonesian National Search and Rescue Agency Muhammad Syaugi announced that the search and rescue operation would be extended for another three days. On 10 November the NSRA ended its search for victims, but on 22 November were continuing to search intensively for the CVR. On 23 November, investigators concluded the victim identification process. Out of 189 people on board, 125 (89 men and 36 women) were identified, including the two foreigners. Another 64 bodies are still unaccounted for. On 14 December, it was reported that Lion Air had paid US$2.8 million for a second attempt to search for the CVR, with a specialized boat being brought in to assist in the search, expected to last 10 days. The attempt began on 20 December, but ended on 3 January 2019 without success. The NTSC announced plans to launch their own search, and were negotiating with the Indonesian Navy to borrow one of their ships. On 8 January 2019, they announced they would be resuming the search for the CVR (using their own funding). The CVR was found by the Indonesian Navy near the crash site, at a depth of 30 m but covered by 8-meter thick mud, on 14 January 2019, more than two months after the accident. A Boeing technician and engineering team, and a team from the US National Transportation Safety Board arrived on 31 October to help with the investigation being conducted by the NTSC. Personnel from the US Federal Aviation Administration (FAA) and engine manufacturer GE Aviation were also sent to Indonesia. A team from Singapore, that had already arrived on the night of 29 October, was to provide assistance in recovering the aircraft's flight recorders. The Australian Transport Safety Bureau sent two of its personnel to assist with the downloading process of the FDR. The aircraft was used on a flight from Ngurah Rai International Airport, Bali to Soekarno-Hatta International Airport, Jakarta the night before the crash. Detailed reports from that flight revealed that the aircraft had suffered a serious incident, which left many passengers traumatized. Passengers in the cabin reported heavy shaking and a smell of burnt rubber inside the cabin. At one point, the aircraft had dropped more than 200 feet (61 m) in a few seconds. The seat belt sign was never turned off from takeoff to landing. A recording of air traffic control communications indicated that the pilot had called a "pan-pan". The crew later decided to cancel the pan-pan and continue the flight to Jakarta. The aircraft's maintenance logbook revealed that the aircraft suffered an unspecified navigation failure on the captain's side, while the First Officer's side was reported to be in good condition. Passengers recounted that the aircraft had suffered an engine problem and were told not to board it as engineers tried to fix the problem. While the aircraft was en route to Jakarta, it had problems maintaining a constant altitude, with passengers stating that it was like "a roller-coaster ride". The chief executive officer of Lion Air, Edward Sirait, said the aircraft had a "technical issue" on Sunday night, but this had been addressed in accordance with maintenance manuals issued by the manufacturer. Engineers had declared that the aircraft was ready for takeoff on the morning of the accident. A later report claimed that a third pilot was on the flight to Jakarta and told the crew to cut power to the stabilizer trim motors which fixed the problem. This method is a standard memory item in the 737 checklist. 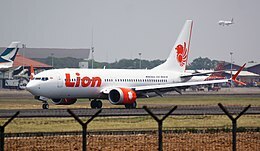 Subsequently, the National Transportation Safety Committee confirmed the presence of an off-duty Boeing 737 MAX 8 qualified pilot in the cockpit but did not confirm the role of the pilot in fixing the problem, and denied that there was any recording of the previous flight in the CVR of Lion Air Flight 610. Indonesian aviation expert Gerry Soejatman speculated that the pitot tubes, used in the airspeed indication system, may have played a role in the crash. They have contributed to previous similar crashes. The Indonesian Meteorology, Climatology, and Geophysical Agency (BMKG) reported that the weather was clear around the time of the crash, with winds at 5 knots (9.3 km/h; 5.8 mph) from the northwest. Visibility was good with no cumulonimbus clouds. Police Hospital Chief Musyafak said that an examination of the body parts indicated that it was unlikely that there had been an explosion or fire on board the aircraft. Aviation experts noted that there were some abnormalities in the altitude and the airspeed of Flight 610. Just three minutes into the flight, the captain asked the controller for permission to return to the airport as there were flight control problems. About eight minutes into the flight, data transmitted automatically by the aircraft showed it had descended to about 5,000 feet (1,500 m) but its altitude continued to fluctuate. The mean value of the airspeed data transmitted by Flight 610 was around 300 knots (560 km/h; 350 mph), which was considered by experts to be unusual, as typically aircraft at altitudes lower than 10,000 feet (3,000 m) are restricted to an airspeed of 250 knots (460 km/h; 290 mph). Ten minutes into the flight, the data recorded the aircraft dropping by more than 3,000 feet (910 m). The last recorded altitude of the aircraft was 2,500 feet (760 m). On 5 November, the NTSC announced that Flight 610 was still intact when it crashed into the sea at high speed, citing the relatively small size of the pieces of debris. The impact was so powerful that the strongest part of the aircraft was obliterated. The NTSC also stated that the engines of Flight 610 were still running when it crashed into the sea, indicated by the high RPM. Further examination of the aircraft's instruments revealed that one of the aircraft's airspeed indicators had malfunctioned for its last four flights, including the flight to Denpasar. On 7 November, the NTSC confirmed that there had been problems with Flight 610's angle of attack (AoA) sensors. Thinking that it would fix the problem, the engineers in Bali then replaced one of the aircraft's AoA sensors, but the problem persisted on the penultimate flight, from Denpasar to Jakarta. Just minutes after takeoff, the aircraft abruptly dived. The crew of that flight, however, had managed to control the aircraft and decided to fly at a lower than normal altitude. They then managed to land the aircraft safely and recorded a twenty-degree difference between the readings of the left AoA sensor and the right sensor. NTSC chief Soerjanto Tjahjono told the press that future reporting or actions, enacted to prevent similar problems on similar aircraft, would be decided by Boeing and US aviation authorities. On 28 November, Indonesia investigators said the Lion Air jet was not airworthy on the flight before the crash. Several relatives of the crash victims have already filed lawsuits against Boeing. On 28 November, the Indonesian National Transportation Safety Committee (NTSC) released its preliminary accident investigation report. After airspeed and altitude problems, an AoA sensor was replaced and tested two days earlier on the accident aircraft. Erroneous airspeed indications were still present on the subsequent flight on 28 October, which experienced automatic nose down trim. The runaway stabilizer non-normal checklist was run, the electric stabilizer trim was turned off, and the flight continued with manual trim; the issues were reported after landing. Shortly after takeoff on 29 October, issues involving altitude and airspeed continued due to erroneous AoA data and commanded automatic nose-down trim via the Maneuvering Characteristics Augmentation System (MCAS). The flight crew repeatedly commanded nose-up trim over the final ten minutes of the flight. The report does not state whether the runaway stabilizer trim procedure was run or whether the electric stabilizer trim switches were cut out on the accident flight. Leeham News, which principally covers Airbus, Boeing, Bombardier and Embraer issues, reported that the crew did not have a clear knowledge that trim runaway checklist will disengage MCAS. Boeing pointed to the successful troubleshooting conducted on 28 October as evidence that the MCAS did not change runaway stabilizer procedures, and emphasised the longstanding existence of procedures to cancel MCAS nose-down commands. On 21 January 2019, the NTSC announced that it would not release transcript from the CVR found a week earlier until the final report was released, expected to be between August and September 2019. However, following the Ethiopian Airlines Flight 302 crash on 10 March 2019 which meant the data from the CVR of the Lion Air Flight 610 were shared among the investigators, media citing anonymous sources reported that CVR recorded the pilots mentioning several problems, trying to climb, and checking the quick reference handbook for a solution. NTSC denied these claims but stated the pilots began to panic at the end of the flight. The CFM International LEAP engines of the 737 MAX have a higher bypass ratio and have a larger nacelle than the engines of previous Boeing 737 models, so the engines are placed higher and further forward in relation to the wing than on previous models. This destabilises the aircraft pitch at higher angles of attack (AoA). To deal with this, Boeing designed a Maneuvering Characteristics Augmentation System (MCAS) for the 737 MAX series. Former Boeing engineers expressed the opinion that a nose down command triggered by a sensor single point of failure is a design flaw if the crew is not prepared, and the FAA was evaluating a fix of the possible flaw and investigating whether the pilots' transition training is adequate. A malfunction in the AoA sensors could lead the MCAS system to believe that the aircraft is stalling when it isn't, causing it to dip the aircraft's nose to recover from a non-existent stall even in level flight. On 6 November, The Wall Street Journal reported that Boeing and the FAA, on the basis of preliminary information gathered in the investigation, were planning to publish warnings about erroneous angle of attack indications on cockpit instrument displays of the 737 MAX in response to the Lion Air accident. The Federal Aviation Administration issued an emergency Airworthiness Directive (AD) requiring that amended operating limitations and procedures relating to erroneous data from an AoA sensor be inserted into the aircraft flight manual of each 737 MAX aircraft, and urged all airlines operating Boeing 737 MAX 8s to heed the warnings. During difference training, pilots of American Airlines and Southwest Airlines converting from earlier Boeing 737 Next Generation models to the 737 MAX were not informed of the MCAS linked to the fatal crash, leaving them concerned that they were possibly untrained with respect to other differences. In November 2018, Aviation Week reviewed the 737 MAX flight crew operations manual and found that it did not mention the MCAS. American Airlines' Allied Pilots Association and Southwest Airlines Pilots' Association were also caught unaware. The Wall Street Journal reported that Boeing had "decided against disclosing more details to cockpit crews due to concerns about inundating average pilots with too much information". On 15 November, the US Air Line Pilots Association (ALPA), the largest pilots' union, representing 61,000 pilots, urged the FAA and NTSB to ensure pilots receive all relevant information addressing a "potential, significant aviation system safety deficiency". ALPA's United Airlines branch, in line with its management, disagrees as the 737 pilot manual includes a standard procedure to shut down the flight-control behavior, and dismissed the MCAS implication in the accident as "speculation" based on the Boeing safety-warning bulletin and the follow-on FAA airworthiness directive. In an internal message on 19 November, Boeing CEO Dennis Muilenburg defended the Flight Crew Operations Manual as describing the MCAS relevant function. On 20 November, Boeing was to hold a conference call with 737 Max operators to detail the new MCAS not present in the Next Generation models. The conference call was cancelled later, to be replaced by a series of regional calls to allow more questions. Lion Air co-founder and former CEO Rusdi Kirana, currently the Indonesian ambassador to Malaysia, reportedly considered cancelling Lion Air's outstanding 190 Boeing aircraft orders – worth some $22 billion at list prices – over what he viewed as an attempt by Boeing to blame Lion Air for the crash. On 31 December, the family of the first officer filed a lawsuit against Boeing, claiming negligence. The lawsuit also claimed that the aircraft's sensors provided inaccurate flight data, causing its anti-stall system to improperly engage, as well as Boeing not providing proper instructions to pilots about how to handle the situation. In March 2019, victims' families reported irregularities, saying that Lion Air pressured them into signing away their rights to seek legal recourse for under-compensation. On 10 March 2019, another 737 MAX 8, operated by Ethiopian Airlines (registration ET-AVJ), crashed shortly after takeoff from Addis Ababa; all 157 people on board perished. This raised further concerns about the safety of the 737 MAX. ^ a b "Indonesia Finds Cockpit Voice Recorder of Crashed Lion Air Jet". Bloomberg News. Retrieved 14 January 2019. ^ "Lion Airlines PK-LQP (Boeing 737 Next Gen – MSN 43000) – Airfleets aviation". airfleets.net. Retrieved 29 October 2018. ^ Sutriyanto, Eko, ed. (15 August 2018). "Lion Air Datangkan Pesawat Baru Boeing 737 MAX 8 ke-10". Tribunnews.com (in Indonesian). Retrieved 28 October 2018. ^ "Factbox: 'Black boxes' the focus of probe in Indonesia's Lion Air crash". Reuters. 29 October 2018. ^ McKirdy, Euan; Faridz, Devianti; McKenzie, Sheena (29 October 2018). "Lion Air flight crashes en route from Jakarta to Pangkal Pinang". CNN. Retrieved 29 October 2018. ^ "Indonesia: Lion Air flight from Jakarta to Sumatra crashes". Al Jazeera. 29 October 2018. Retrieved 29 October 2018. ^ "ASN Aviation Safety Database". Aviation Safety Network. Retrieved 30 October 2018. ^ "Indonesia's Lion Air Flight JT-610 crashes into the sea with 189 on board, officials say". CBS News. 29 October 2018. Retrieved 29 October 2018. ^ Nur Azizah (29 October 2018). "Lion Air Jatuh, Basarnas: Keajaiban Kalau Ada yang Selamat". Detik.com (in Indonesian). Retrieved 1 November 2018. ^ Hashim, Firdaus (29 October 2018). "Lion Air 737 Max 8 crash confirmed, 189 dead". Flightglobal. Retrieved 29 October 2018. ^ Baker, Sinéad (31 October 2018). "What we know about the victims of the Lion Air plane crash off Indonesia, where there were 'likely no survivors'". Business Insider. Retrieved 1 November 2018. ^ a b Zhou, Naaman (29 October 2018). "Lion Air crash: officials say 188 onboard lost flight JT610 – latest updates". The Guardian. Retrieved 29 October 2018. ^ Elvan Dany Sutrisno (29 October 2018). "10 Pegawai BPK Jadi Penumpang Lion Air JT 610, Ini Daftar Namanya". Detik.com (in Indonesian). ^ Iin Yumiyanti (29 October 2018). "2 Auditor Andalan BPKP Jadi Korban Pesawat Lion Air yang Jatuh". Detik.com (in Indonesian). ^ "3 Pegawai Kementerian ESDM Jadi Korban Lion Air JT-610 Jatuh". cnnindonesia.com (in Indonesian). 29 October 2018. ^ Dhani Irawan (29 October 2018). "3 Jaksa Jadi Korban Pesawat Lion Air JT 610, Ini Identitasnya". Detik.com (in Indonesian). ^ antara, CNN Indonesia (29 October 2018). "Tiga Anggota Polri Jadi Penumpang Lion Air JT-610 yang Jatuh". cnnindonesia.com (in Indonesian). ^ "6 Anggotanya Jadi Korban Lion Air, Ketua DPRD Babel Sebut Pengaruhi Kinerja Dewan". Kompas.com (in Indonesian). 3 November 2018. ^ Saputra, Andi (29 October 2018). "Tiga Hakim Ada di Pesawat Lion Air yang Jatuh, MA Berduka". Detik.com (in Indonesian). ^ Collie, Jason; Williams, Sophie (29 October 2018). "Lion Air plane crash latest: 'No survivors' after Indonesia passenger jet crashes with 189 on board". London Evening Standard. Retrieved 29 October 2018. ^ Gasperetti, Marco (29 October 2018). "Andrea Manfredi, chi era il 26enne italiano morto nell'incidente aereo in Indonesia". Corriere della Sera (in Italian). Retrieved 29 October 2018. ^ a b Chan, Francis; Soeriaatmadja, Wahyudi (29 October 2018). "Lion Air plane carrying 188 on board crashes into sea shortly after take-off from Jakarta". The Straits Times. Retrieved 29 October 2018. ^ a b c Massola, James; Rompies, Karuni; Rosa, Amilia; Noyes, Jenny (29 October 2018). "Lion Air flight crashes in Indonesia". The Canberra Times. Retrieved 29 October 2018. ^ "Lion Air crash: Boeing 737 plane crashes in sea off Jakarta". BBC. 29 October 2018. Retrieved 29 October 2018. ^ "No plane, no flight data recorder – search & recovery continue off Jakarta". The Thaiger. 31 October 2018. Retrieved 31 October 2018. ^ Shibani Mahtani; Ainur Rohmah (29 October 2018). "Indonesian plane crashes into the sea with more than 180 on board". The Washington Post. Retrieved 29 October 2018. ^ Danu Damarjati (29 October 2018). "Pesawat Lion Air Hilang Kontak Usai 13 Menit Terbang". Detik.com (in Indonesian). Retrieved 1 November 2018. ^ Danu Damarjati (29 October 2018). "Lacak Lion Air di Karawang, Basarnas Kirim 3 Kapal dan 1 Helikopter". Detik.com (in Indonesian). Retrieved 1 November 2018. ^ Natalia Bulan Retno Palupi, ed. (29 October 2018). "Pihak Pertamina Sebut Pesawat Lion Air JT610 Jatuh di Dekat Fasilitasnya". TribunNews.com (in Indonesian). Retrieved 1 November 2018. ^ Luthfiana Awaluddin (29 October 2018). "Petugas Pertamina Lepas Pantai di Karawang Kaget Lihat Lion Air Jatuh". Detik.com. Retrieved 1 November 2018. ^ Nur Azizah Rizki. "Puing Pesawat Lion Air Ditemukan di Perairan Karawang". Detik.com (in Indonesian). Retrieved 1 November 2018. ^ Tani, Shotaro (30 October 2018). "Indonesia orders inspection of all Boeing 737 Max 8 in country". Nikkei Asian Review. Retrieved 30 October 2018. ^ "Kemenhub Sudah Investigasi 11 Pesawat Boeing 737-MAX Lion Air, Hasilnya?". Detik. Retrieved 7 November 2018. ^ a b Lamb, Kate (29 October 2018). "Lion Air passenger plane flying from Jakarta crashes into the sea – latest updates". The Guardian. Retrieved 29 October 2018. ^ Fauzi Rachman, Fadhly. "Pesawat Lion Air Jatuh, Menhub Bentuk Crisis Center". Detik.com. Retrieved 1 November 2018. ^ "Bandara Depati Amir Pangkal Pinang Buka Posko Crisis Center - Tribun Jogja". Tribun Jogja (in Indonesian). 29 October 2018. Retrieved 1 November 2018. ^ Hisar Hasibuan. "Lion Air Jatuh, Crisis Center Dibuka di Jakarta dan Pangkal Pinang". Harian MedanBisnis. Retrieved 1 November 2018. ^ Dahnur, Heru. "Manajemen Berangkatkan Keluarga Penumpang Lion Air yang Jatuh ke Jakarta". Kompas. Retrieved 1 November 2018. ^ Fida Ul Haq, Muhammad. "Lion Air Siapkan Penginapan Bagi Keluarga Penumpang Pesawat Jatuh". Detik.com. Retrieved 1 November 2018. ^ Indra Komara. "RS Polri Beri Trauma Healing ke Keluarga Korban Lion Air JT 610" (in Indonesian). Detik. Retrieved 7 November 2018. ^ Akfa Nasrulhak. "Komisi V DPR akan Cek SOP Kelaikan Pesawat Lion Air JT 610". Detik. Retrieved 7 November 2018. ^ "Lion Air Jatuh, Bamsoet Minta Pemerintah Perketat Izin Penerbangan". Detik. Retrieved 7 November 2018. ^ "Buntut Lion Air Jatuh, Jokowi Minta Aturan Penerbangan Murah Dikaji Ulang". Detik. Retrieved 7 November 2018. ^ Rizki, Azizah. "20 Pegawainya Jadi Penumpang Lion JT 610, Menkeu Datangi Basarnas". Detik.com. Retrieved 1 November 2018. ^ Azanella Ayu, Luthfia. "Pita Hitam di Lengan, Tanda Duka dan Kehilangan Kementerian Keuangan". Kompas. Retrieved 1 November 2018. ^ "Sri Mulyani Beri Penghargaan ke PNS Kemenkeu Korban Lion Air". Detik. Retrieved 7 November 2018. ^ Komara, Indra. "Menkes Temui Keluarga Staf Kemenkes Korban Lion JT 610 di RS Polri". Detik.com. Retrieved 1 November 2018. ^ Nugroho, Wisnu. "Lion Air Jatuh, Jokowi: Belum Selesai Satu Musibah, Musibah Lain Datang Lagi". Kompas. Retrieved 1 November 2018. ^ "Saat Jokowi Tertunduk Hingga Pandangi Sepatu Bayi Milik Korban Pesawat Lion Air JT 610". Tribun News. Retrieved 1 November 2018. ^ Thomas, Geoffrey (31 October 2018). "DFAT tells bureaucrats told not to fly with Lion Air, Batik Air or Wings Air". The West Australian. Retrieved 1 November 2018. ^ "Kusuma, Hendra". Detik.com. Retrieved 1 November 2018. ^ "Menhub Bakal Temui Australia Terkait Larangan Naik Lion Air". Liputan6. Retrieved 1 November 2018. ^ Damarjati, Danu. "Pihak Korban Tewas Lion Air Dapat Santunan Rp 50 Juta dari Jasa Raharja". Detik.com. Retrieved 1 November 2018. ^ "KPI Ingatkan Pedoman Peliputan Jatuhnya Lion Air JT 610". Detik. Retrieved 7 November 2018. ^ "Lion Air crash: Indonesian media warned over 'unethical coverage'". ABC. Retrieved 7 November 2018. ^ "Direktur Lion Air Dirumahkan untuk Permudah Pemeriksaan KNKT". CNN Indonesia. 31 October 2018. Retrieved 31 October 2018. ^ Ibrahim, Achmad; Wright, Stephen (29 October 2018). "Indonesia's Lion Air says it's lost contact with airplane". The Seattle Times. Associated Press. Retrieved 29 October 2018. ^ Irawan, Dhani. "TNI AL Kerahkan KRI hingga Tim Kopaska Cari Korban Lion Air JT 610". Detik.com. Retrieved 1 November 2018. ^ "Bawa 4 Alat Canggih, Kapal Riset BPPT Ikut Cari Lion Air JT 610". Detik. Retrieved 1 November 2018. ^ Azizah, Nur. "Basarnas Tetapkan Masa Evakuasi Lion Air JT 610 Selama 7 Hari". Detik.com. Retrieved 1 November 2018. ^ a b Suhartono, Muktita; Beech, Hannah (28 October 2018). "Indonesia Plane Crash Adds to Country's Troubling Safety Record". The New York Times. Retrieved 30 October 2018. ^ Azizah, Nur. "Banyak Korban di Pesawat Lion Air, Basarnas Fokus di Penyelaman". Detik.com. Retrieved 1 November 2018. ^ Azizah, Nur. "Evakuasi Lion Air JT 610 Terkendala Arus Deras dan Jarak Pandang". Detik.com. Retrieved 1 November 2018. ^ "Ini Daftar dan Pembagian Tugas Kapal-Heli Pencari Lion Air JT 610". Detik. Retrieved 7 November 2018. ^ "Ini Peta Lokasi Pencarian Pesawat Lion Air JT 610". Detik. Retrieved 7 November 2018. ^ "Tim SAR Perluas Area Pencarian Korban Lion Air hingga Indramayu". Detik. Retrieved 7 November 2018. ^ "Total 33 Kantong Jenazah Korban Lion Air Dibawa ke RS Polri". Detik. Retrieved 7 November 2018. ^ "Pencarian Black Box Lion Air, Ping Locator Sempat Dapat Suara Samar". Detik. Retrieved 7 November 2018. ^ McKirdy, Euan; Watson, Ivan. "Lion Air crash: Investigators detect 'pings' which could lead to flight recorders". cnn.com. Retrieved 31 October 2018. ^ a b Wildansyah, Samsudhuha. "Satu Korban Lion Air Teridentifikasi". Detik.com. Retrieved 1 November 2018. ^ a b "Serpihan & bagian tubuh korban Lion Air jatuh dibawa ke crisis center Jakarta". Merdeka. Retrieved 1 November 2018. ^ Sukmana, Yoga. "Hari Ini, Area Pencarian JT 610 Diperluas, 4 Kapal Canggih Dikerahkan". Kompas. Retrieved 1 November 2018. ^ "Bantu Evakuasi Korban Lion JT 610, Polri Kerahkan 651 Personel". Detik.com. Retrieved 1 November 2018. ^ "Fokus Cari Badan Lion JT 610, Alat Sonar dan 50 Penyelam Dikerahkan". Detik.com. Retrieved 1 November 2018. ^ "KR Baruna Jaya Temukan Serpihan Diduga Sayap Lion Air di Dasar Laut". Detik. Retrieved 7 November 2018. ^ "KR Baruna Jaya BPPT Tangkap Sinyal Black Box Lion Air JT 610!". Detik. Retrieved 7 November 2018. ^ Alfons, Matius. "Bagian Black Box Lion Air PK-LQP yang Ditemukan Adalah FDR". Detik.com. Retrieved 1 November 2018. ^ Silviana, Cindy. "Indonesian investigators examine black box from crashed jet". .reuters.com. Retrieved 3 November 2018. ^ "Lion Air crash: 'Black box' from crashed jet retrieved". BBC. 1 November 2018. Retrieved 1 November 2018. ^ a b "Investigators Download 69 Hours of Data From Crashed Lion Air Jet". The Wall Street Journal. 4 November 2018. Retrieved 5 November 2018. ^ "Fokus Cari CVR Lion Air PK-LQP, 869 Personel Gabungan Dikerahkan". Detik. Retrieved 7 November 2018. ^ "Penyelam Kopaska Temukan Bagian Mesin Lion Air PK-LQP". Detik. Retrieved 7 November 2018. ^ "Roda Lion Air Diangkat dari Dasar Laut, Ini Penampakannya". Detik. Retrieved 7 November 2018. ^ "Tim DVI Polri Periksa 272 Bagian Tubuh Korban Lion Air". Detik. Retrieved 7 November 2018. ^ "Indonesian rescue diver dies while searching for victims of Lion Air jet crash". abc.net.au. 3 November 2018. Retrieved 3 November 2018. ^ "Lion Air crash claims another life". news.com.au. Retrieved 5 November 2018. ^ Rahayu, Lisye Sri. "Bodi Lion Air PK-LQP Terdeteksi, Kondisinya Rapuh". Retrieved 28 November 2018. ^ Rahayu, Lisye Sri. "Penyelam Dikerahkan ke Lokasi Diduga Bodi Lion Air PK-LQP". Retrieved 28 November 2018. ^ "Hari ke-7 Evakuasi Lion Air PK-LQP, 175 Penyelam Dikerahkan". Detik. Retrieved 7 November 2018. ^ "Operasi SAR Lion Air Diperpanjang 3 Hari, Fokus Evakuasi dan CVR". Detik. Retrieved 7 November 2018. ^ "Lion Air Search: CVR No Longer Transmitting Signals". Retrieved 23 November 2018. ^ "Indonesia keeps up search for crashed jet's black box as signal drops out". Channel NewsAsia. 22 November 2018. ^ "Indonesia wraps up Lion Air crash victim identification". The Jakarta Post. Retrieved 24 November 2018. ^ Creedy, Steve (14 December 2018). "Lion Air funds new search for cockpit voice recorder". Airline Ratings. Retrieved 14 December 2018. ^ "Search for cockpit voice recorder of crashed Lion Air resumes in Indonesia". The Nation. 20 December 2018. Retrieved 30 December 2018. ^ "Lion Air ends search for CVR but Indonesian investigators to launch their own". Malay Mail. 3 January 2019. Retrieved 3 January 2019. ^ "Indonesia to resume search for crashed Lion Air jet's cockpit voice recorder". Malay Mail. 8 January 2019. Retrieved 8 January 2019. ^ Sri Rahayu, Lisye (14 January 2019). "CVR Lion Air Diangkat dari Dasar Laut yang Tertutup Lumpur 8 Meter" (in Indonesian). Detik. ^ Safitri, Eva (14 January 2019). "CVR Lion Air Ditemukan di Kedalaman 30 Meter Perairan Karawang" (in Indonesian). Detik. ^ Mufti, Riza (30 October 2018). "Boeing, US govt teams on way to join Lion Air crash investigation". The Jakarta Post. Retrieved 31 October 2018. ^ "Pengakuan Penumpang Lion Air PK-LQP Denpasar-Jakarta: Semua Teriak Allahuakbar". Tribun News. Retrieved 7 November 2018. ^ Kami, Indah Mutiara. "Lion Air PK-LQP Lapor Sinyal Urgen Pan-pan di Malam Sebelum Jatuh". detiknews. Retrieved 13 November 2018. ^ "Pengakuan Penumpang Lion Air PK-LQP Denpasar-Jakarta: Semua Teriak Allahuakbar". MSN. Retrieved 7 November 2018. ^ "Ini Dugaan Masalah Lion Air PK-LQP di Malam Sebelum Jatuh di Karawang". Detik. Retrieved 7 November 2018. ^ Indah Mutiara Kami (29 October 2018). "Kesaksian Penumpang Soal Masalah di Lion Air Denpasar-Jakarta". Detik.com. Retrieved 1 November 2018. ^ Sapiie, Marguerite Afra; Dipa, Arya (30 October 2018). "Investigators mush examine Lion Air's claim to have resolved technical problem: Expert". The Jakarta Post. Retrieved 31 October 2018. ^ "Indonesia plane crash: Lion Air CEO Edward Sirait says aircraft had technical problem in previous flight". The Financial Express. 29 October 2018. ^ Levin, Alan; Suhartono, Harry (19 March 2019). "Pilot Who Hitched a Ride Saved Lion Air 737 Day Before Deadly Crash". Bloomberg News. Bloomberg. Retrieved 20 March 2019. ^ Post, The Jakarta. "KNKT confirms presence of third pilot who saved earlier Lion Air flight". The Jakarta Post. Retrieved 29 March 2019. ^ "Indonesia orders inspection of all Boeing 737-MAX airliners in wake of Lion Air crash, as concerns raised over pitot pipe". The Daily Telegraph. 30 October 2018. Retrieved 1 November 2018. ^ Goldman, Russell (30 October 2018). "Did a Small Metal Tube Bring Down an Indonesian Airliner?". The New York Times. Retrieved 1 November 2018. ^ Gibran Maulana Ibrahim (29 October 2018). "BMKG: Tak Ada Masalah Cuaca Sesaat Sebelum Lion Air JT 610 Jatuh". Detik.com. Retrieved 1 November 2018. ^ Gregorius Aryodamar P. (1 November 2018). "Polisi: Hasil Identifikasi Korban, Kecil Kemungkinan Lion Air Meledak" (in Indonesian). IDN Times. ^ McMah, Lauren (1 November 2018). "Heartbreaking photo of Lion Air crash aftermath". News.com.au. ^ Putra Dewangga Candra Seta (31 October 2018). "Sebelum Jatuh, Lion Air JT 610 Terbang dengan Speed 340, Pilot Senior: Itu Tak Masuk Akal". Tribunnews.com (in Indonesian). Kompas Gramedia Group. ^ Fajar Pratama (31 October 2018). "Ketinggian Naik-Turun, Lion Air JT 610 Diduga Terbang Terlalu Cepat". Detik.com (in Indonesian). ^ "Analisa KNKT: Pesawat Lion Air PK-LQP Langsung Pecah dan Terbelah Saat Menghantam Air Laut". Tribun News. Retrieved 7 November 2018. ^ "KNKT: Mesin Pesawat Lion Air Masih Hidup saat Menyentuh Air". Okezone. Retrieved 7 November 2018. ^ "KNKT: Airspeed Indicator Lion Air PK-LQP Rusak di 4 Flight Terakhir". Detik. Retrieved 7 November 2018. ^ "KNKT Curigai Kerusakan AOA Penyebab Lion Air PK-LQP Jatuh". CNN Indonesia. Retrieved 7 November 2018. ^ "Crashed Lion Air 737 had damaged air-speed indicators". Phuket: The Thaiger. 7 November 2018. Retrieved 7 November 2018. ^ "Lion Air jet was not airworthy on the flight before crash, Indonesia investigators say". The Guardian. 28 November 2018. Retrieved 28 November 2018. ^ "Preliminary Aircraft Accident Investigation Report" (PDF). Komite Nasional Keselamatan Transportasi. November 2018. ^ a b c d e f "Boeing Statement on Lion Air Flight 610 Preliminary Report" (Press release). Boeing. 27 November 2018. ^ "Leehan News and Comment : About". Leeham. ^ Bjorn Fehrm (28 November 2018). "Indonesian authorities release preliminary Lion Air crash report". Leeham News. ^ "No public details on crashed Lion Air voice recorder until final report: Indonesian official". Reuters. 22 January 2019. Retrieved 23 January 2019. ^ Reuters, Cindy Silviana, Jamie Freed and Tim Hepher. "Panic, surrender: Doomed Lion Air jet pilot's last words revealed in recovered recording". ABS-CBN News. Retrieved 29 March 2019. ^ "Official: 3rd pilot helped on next-to-last Lion Air flight". The Public's Radio. 21 March 2019. Retrieved 29 March 2019. ^ Bjorn Fehrm (14 November 2018). "Boeing's automatic trim for the 737 MAX was not disclosed to the Pilots". Leeham News. ^ Dominic Gates (14 November 2018). "FAA evaluates a potential design flaw on Boeing's 737 MAX after Lion Air crash". Seattle Times. ^ "Flawed analysis, failed oversight: How Boeing, FAA certified the suspect 737 MAX flight control system". The Seattle Times. 17 March 2019. Retrieved 22 March 2019. ^ "Lion Air crash: Boeing and FAA to issue advice to airlines on 737 Max jets – report". The Guardian. 7 November 2018. Retrieved 7 November 2018. ^ "FAA Issues 737 MAX Emergency AD". Australian Aviation. Aviator Media. 8 November 2018. Retrieved 15 November 2018. ^ "EMERGENCY AIRWORTHINESS DIRECTIVE #2018-23-51" (PDF). U.S. Federal Aviation Administration. 7 November 2018. ^ "FAA Urges Airlines to Follow Boeing's Advice After 189 People Killed in 737 MAX Crash". Time. Retrieved 7 November 2018. ^ Dominic Gates (12 November 2018). "U.S. pilots flying 737 MAX weren't told about new automatic systems change linked to Lion Air crash". Seattle Times. ^ Jon Hemmerdinger (13 November 2018). "Airline industry rushes to understand nuances in 737 Max systems". Flightglobal. ^ Jon Ostrower (13 November 2018). "What is the Boeing 737 Max Maneuvering Characteristics Augmentation System?". The Air Current. ^ Jon Hemmerdinger (15 November 2018). "ALPA asks regulators to address 737 Max safety concerns". Flightglobal. ^ Dominic Gates (16 November 2018). "Dispute arises among U.S. pilots on Boeing 737 MAX system linked to Lion Air crash". Seattle Times. ^ Jon Ostrower (19 November 2018). "Boeing CEO disputes MCAS details "intentionally withheld" from airlines". The Air Current. ^ David Koenig (21 November 2018). "Boeing delays call to discuss issues with its newest plane". Associated Press. ^ McCoppin, Robert. "Lawsuit filed in Cook County claims negligence by Boeing in Lion Air crash in Java Sea that killed 189". chicagotribune.com. Retrieved 31 December 2018. ^ "Lion Air Crash Families Say They Were Pressured to Sign No-Suit Deal". The New York Times. 21 March 2019. Retrieved 22 March 2019. ^ "More families sue Boeing over Lion Air crash, citing defective design and 'inadequate safety warnings'". Washington Post. 21 March 2019. Archived from the original on 22 March 2019. Retrieved 22 March 2019. ^ "Ethiopian Airlines crash is second disaster involving Boeing 737 MAX 8 in months". cnn.com. 10 March 2019. Retrieved 10 March 2019. Glanz, James; Creswell, Julie; Kaplan, Thomas; Wichter, Zach (3 February 2019). "Behind the Lion Air Crash, a Trail of Decisions Kept Pilots in the Dark". The New York Times.